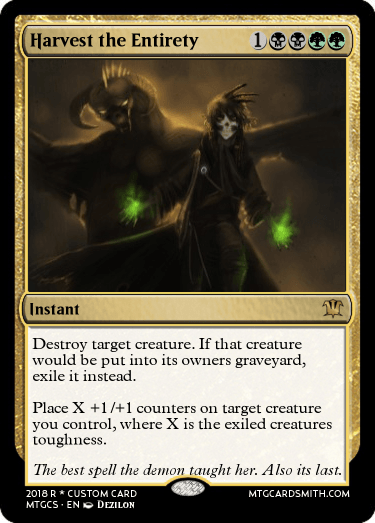 After my recent challenge, 'Phyrexian Perfection', I decided I'd think up another similar yet different challenge. My absolute favorite set in MTG has got to be Innistrad, and all sets based on the lovely plane of insanity. As such I personally made two sets, 'Innistrad return to Madness' and 'Legends of Innistrad', and with those in mind, came the idea for this challenge. Based around my set 'Legends of Innistrad', I want you (yes, YOU) to make some cards you'd find on Innistrad. Not any cards though, something... legendary. A legend made real you might hear on Innistrad. Though some rules and clarification are needed. 2. One of the three must be legendary, the other two can simply support it and give more lore to the legend, but can also be legendary. 3. A lore blurb isn't needed, but it may help you alot. Trust me. 4. No old cards. I know you probably have some good ones, but... well, I want something fresh. Something new. 5. Flavor text! If you can, try to fit some flavor text on. It isn't needed, but I always love it. Though new interesting mechanics overrule it every time. If you want to skip my LONG example, go ahead, can't blame you. But if you don't... here's a legend (A shortened version, as I REALLY don't like my last part of it) and supporting cards I made for a challenge a while ago, useful for an example here. Naturally though, all of this had a toll on her, namely her sanity. From seeing her parents ripped apart to the whispers of demons throughout her childhood, all that truely remained in her mind was what she had been taught, and the memory of her mother and father's fate. Carrying this with her she fled, fleeing to the woods of the Ulvenwald to live away from society and the demons, hoping to never see them again whilst also believing all people were cruel and uncaring, thinking no-one who was alive cared about anyone, even their children. As her parents death taught her, one’s personal wealth is more important than what could happen to one’s family as a result. Keeping this as her motif, and the powers as her method of living, she killed all who crossed her path in the already deadly forest of the Ulvenwald, whether on paths or lost in the winding woods, harvesting from them flesh to eat, bones for tools, clothes to wear, and souls… souls she would eventually use to sustain her life for near-immortality. All having begun due to her parents decision to make a deal with a devil. Oh yeah! Innistrad? Scratch my suggestion, this is WAAY better. My favorite block, I will be dropping submissions when I can get a chance to @Shadow29870. I went with Shadows Over Innistrad, my 1st thought was to pick Innistrad, but Jace was everywhere on Shadows Over Innistrad and everything was getting warped in that storyline by Emrakul, so maybe Jace somehow got twisted and turned into a Zombie...? What do you think? 2. 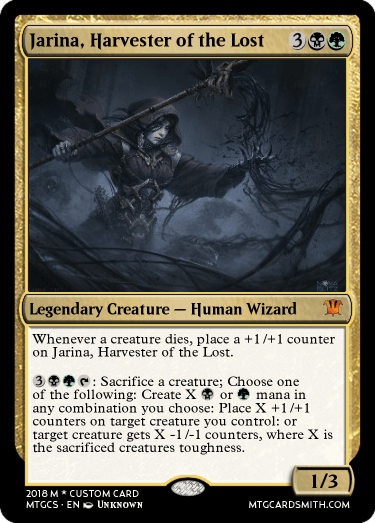 I will say though, I was hoping for more... crafted legends, as opposed to existing ones altered. AND AH. I REALLY wish I had premium now. She'd get the nice legendary border. I'm barely resisting the urge to buy it for a moth. Let me think Innistrad that is at the bottom of my list but still worth a shot at a card :). I chose to represent my legendary creature with 3 of her own cards showing her character progression. Halea was a cathar in the church of Avacyn, and none were more devoted to their duty. Above all, she held the ideals of Avacyn sacred. Protecting both the weak and the wicked, she embodied all that was the godlike Angel. 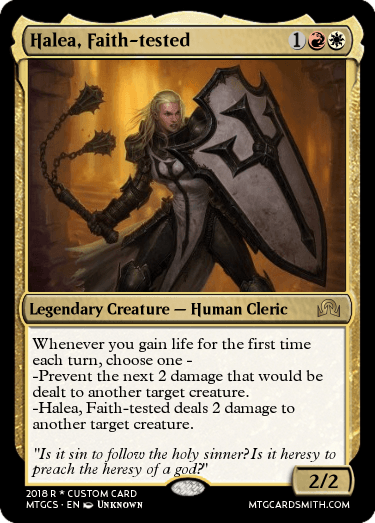 But when madness overtook Innistrad and the Angel of Hope began to preach purifying sin instead of protection and absolution, Halea was met with a crisis of faith. The angel-god whom she worshipped and idolized no longer stood for the ideals of the church. Who should she follow? The order she had tirelessly worked for all her life, or the eternal angel who surely knew good from evil? In the end, her blind devotion to Avacyn overtook her sense of right and wrong. 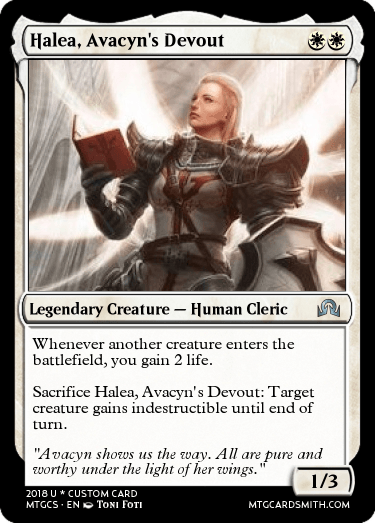 Halea chose to follow Avacyn, the Purifier, forsaking the church and the 'impure' it once protected. She followed Avacyn through the countryside, purifying Thraben, Gavony, and Stensia alike. Yes, the twisted, fiery blade she wielded burned their flesh, but it also cleansed them of sin. If they were truly pure, no harm would come to them. Of that, Avacyn had preached. And for Avacyn, she would do anything. Noah Huan (say it three times fast), also known as the laughing lich, is a compulsive trickster and knave. Anarchic, rebellious and scornful of authority, Noah ensures that chaos reigns supreme wherever he goes and misrule is always the order of the day. Before he ascended to the ranks of the undead, Noah went by quite a different name (though it is now lost to the mists of time). He was a narcissistic young man prone to wild mood swings and violent outbursts. His village, not really understanding Noah's behaviour, shunned him and did little to try and help him. One night, however, Noah had a strange revelation. His great passion had always been for stories and myths, and he had become a collector of such tales which he picked up from passing acting troops and storytellers. Noah's revelation was this: that the most enduring character in fiction was the trickster. The rogue who always won the day with his brain rather than his brawn. Noah realised that humans identify with the trickster more than any other character, since the human being has always relied on its cunning to get the better of other species. Vowing to become the ultimate trickster, Noah christened himself with his new name and set out on a journey to upright the social order. Initially benevolent, saving the oppressed from their dictators and laughing in the face of adversity, Noah's trickery quickly took a malign turn. Noah began to see that if he was to become immortalised by story and song, he must become infamous. Eventually Noah's mockery angered one noble too many and he was seized by royal guards and imprisoned. The next day he was executed. Unbeknownst to his captors, however, Noah had done a deal with an other-worldly power. A creature that called itself the Raven and claimed to be a old god, patron of tricksters and conmen, had struck a pact with Noah. In exchange for immortality, Noah must become the ultimate trickster, plaguing authority and bringing death upon the heads of oppressors and tyrants, claiming their souls for the Raven's own dark purposes. So it was that Noah became the laughing lich. He now travels Innistrad, bringing chaos with him. During his travels, Noah has become unhinged and his behaviour is increasingly erratic and unusual. During Emrakhul's invasion of Innistrad, Noah was lauding over a small town at the edge of civilisation, forcing the inhabitants to indulge his chaotic whims. Seeing Emrakhul as a symbol of order, forcing all things to conform to her own nature, Noah struck out against the Eldrazi threat. The Raven aided him, furthering its own devilish plans. @Shadow29870 And by the way, it's Innistrad, not Innestrad. And I... may have ranted about this and all on my phone but... alas I must hold back till I judge to reveal that. AHHHH I HATE WAITING. Why thank you my good sir, I try to please. Also, nice cards and legend! Not quite a progression basis, more moultiple cards, and it works quite well. Can't way to judge this. 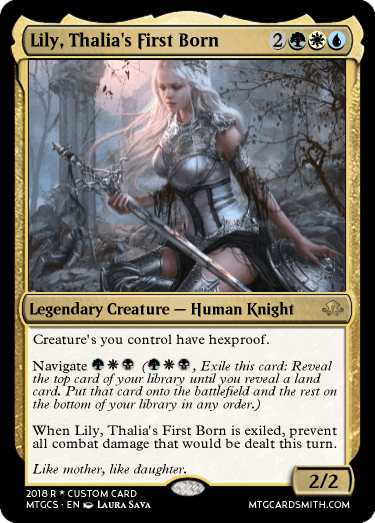 -INHALE- AHHHH IT'S A THALIA CARD AHHHHHHHHHHH HUMAN AHHHHHH. @sorinjace He's just a troll. Yee. I just do that to mess around. Hehe. I love the undead after all so humans freak me out. Er... no. Just me messing around. You entered this so be careful. I'm not afraid to put my bias in based on you saying that for my judging. @Shadow29870 So, how old are you? 13? @Shadow29870 it's cool. I didn't realize how much of the entries here was human. I'll try to come up with a nonhuman innistrad creature for my last one for you since this was my 2nd entry already. (PS if your interested in a hug type contest check out savor the flavor. You make cards featuring flavortext from another Cardsmith card that they came up with first. That's basically it. There hasn't been many entries so it'd be cool to see some new ones. OK well TTYL! 17 actually. I think you'd be about 13 here from your reaction to this. And hey, you can replace your entries with better cards if you wish. "I'm not afraid to put my bias in based on you saying that for my judging." "-INHALE- AHHHH IT'S A THALIA CARD AHHHHHHHHHHH HUMAN AHHHHHH." Are you sure you're 17? Seems like you're the one who is just not yet hit the puberty. Yep, biased judgment. Meaning you are less likely to win. And yes, I can act like a child. What's the point in being older if you can't act childlike at times? Life isn't much fun being serious all the time. Anywho, I'll leave it at 'you're more likely to lose the contest now unless you really wow me' and goodbye. Have a nice day sir or madam! Anywho, now that that's gone, what's up man? And, where might the challenge you spoke of be? @Shadow29870 it fell back to page 2. It's called Savor the Flavor Text (I think or it's just savor the flavor) I'm working on an example card as we speak for it I'm using flavor text from a cool card by @dechujoh64. @Sorinjace , sounds fun. I commented there so check it. I can't wait for home so I can join in... Also! How does one ever get a contest in for Circuit challenges? I'm curious.